Kids bothering you while you’re trying to bake holiday cookies? Have they been out of school too long and Christmas is still a week away? Do you need to know how many more times A Christmas Story is on before you actually sit down and watch it with the family? When did they say the Royal Pains wedding special was on? Are you looking for a comprehensive guide to all (or at least most) of the holiday programming? 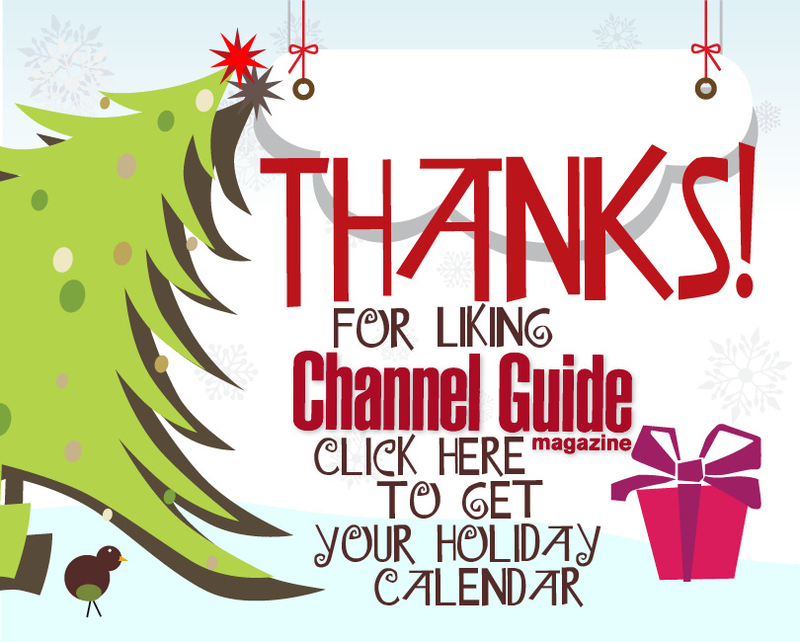 Just go to Facebook and find Channel Guide Magazine. Once there, you’ll see a button like the one above. Click on it and you’ll be taken to a link to download your Free Holiday TV Calendar. No frills, just holiday programming from Sunday, Nov. 18 through Tuesday, Dec. 25. This handy 2-page calendar is just what you need to get everyone towing the line in your house this holiday season. 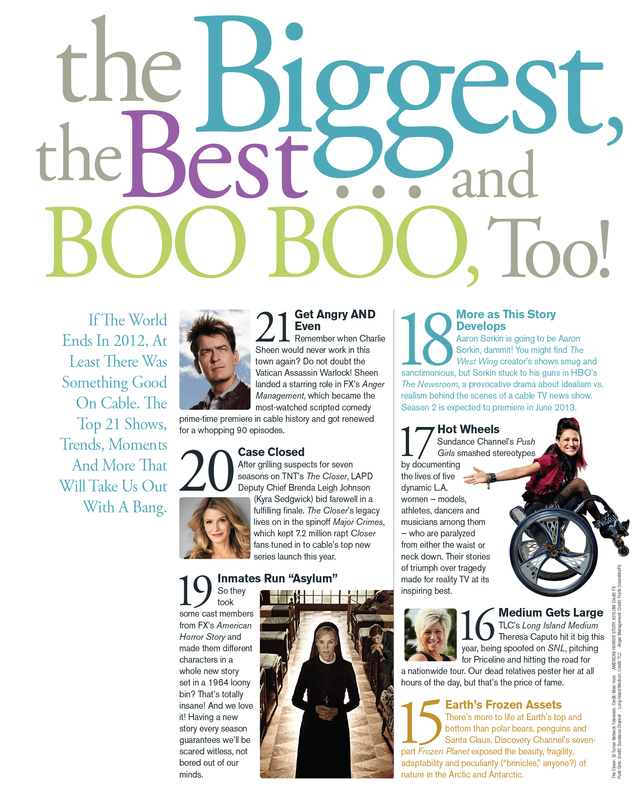 Go now and while you’re there you can examine the benefits a subscription to Channel Guide Magazine has to offer. Last night (Tuesday, Nov. 20) was the elimination show that narrowed The Voice contestants down to eight. I did a quick and dirty watch of Monday’s two-hour show and in doing so, I completely missed one of my favorites (Cody Belew) performance. Thank goodness so many other blogs, radio show web sites and other e-spots are happy to slap together a recap (so what if grammar and correct spelling gets shot out the window in the process). I can’t condemn them, I’ve watched my share of them in the last few weeks to get updated as to what’s been going on. After seeing Bryan Keith’s performance of the Billy Joel song, I can understand why he was not chosen to move forward. There’s no way of knowing who suggested that he sing that song. I know I read somewhere that he was (I’m only putting it in my own vernacular here) honoring his New York roots, but if that’s true, that are far better songs about New York that he could have sung. The goal was to get iTunes users to buy/vote and Billy Joel does not appeal to the age bracket that’s likely to do that, especially at this stage of the game. As far as Sylvia Yacoub goes, I was struck dumb when she was eliminated. I felt she definitely had what it took to go all the way – far more than Melanie Martinez, but that’s where having the right coach comes in. On Tuesday morning I went to iTunes and bought Cody’s song and Terry McDermott’s and that was just from “Previewing” them. I didn’t bother buying Bryan Keith’s, because in my opinion he had already lost the ability to move ahead (and I personally do not like Billy Joel’s music, I don’t care who’s singing it). Even from watching the Monday night show I knew Cassadee Pope and Amanda Brown would move forward due to their performance and THEIR SONG CHOICES. So my predicitions were half right. I still think Cody and Terry will make it to the final four. On another note I was thrilled to see a Kia commercial featuring Juliet Simms last night. I hope that means she’s still making music. USA Today Dubs TWD Essential Viewing; Andrew Lincoln Is TVLine Performer of the Week – The Walking Dead – AMC. Wow! is about all I could say once I read this article. If you’re not watching The Walking Dead yet, why not? Just take a look at the list of “Tags” I put in for this post and that should give you an idea of how many media outlets have been commenting POSITIVELY on The Walking Dead. Just one of their episodes turns in millions of viewers, the kind of numbers some series would be happy to have for an entire season. Adweek‘s short list of the hottest media properties includes The Walking Dead in the “Best reason to watch TV now,” “Biggest social butterfly” and “Show that keeps you on the edge of your seat” categories. TV by the Numbers reports that last week’s episode was the highest-rated cable show on Sunday, recording a rating of 5.6 in the 18-49 demographic, up from from 4.9 last week. Some Cool Gadgets To Pack For Your Holiday Vacations | Home Controls Blog. I guess I’m a long way from writing about Quality TV for Baby Boomers but I was visiting some of the blogs that I follow (AirportsMadeSimple) and I saw their repost from Home Controls. So here are some of the coolest, newest gadgets on the market right now for travelers or heck, just for you! This is reblogged (I guess that’s one of those words that will turn up in a new dictionary soon) from Home Controls via AirportsMadeSimple. By the way, that’s one blog (AirportsMadeSimple) you Baby Boomer Travelers might want to “Follow.” It blogs about airports and has all kind of information on all kinds of airports. My favorite gadget is the PowerCurve Mobile Surge Protector. I’d buy that to use for road trips. Wherever you travel, safely power and charge your sensitive electronics with the 360 Electrical PowerCurve Mobile Surge Protector. 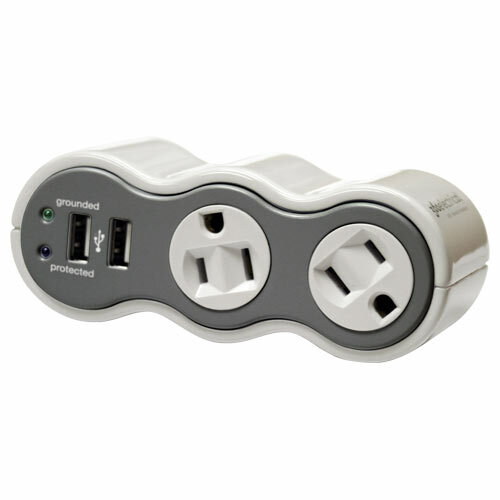 This compact surge protector plugs into an existing outlet, providing two power outlets and two USB ports. Better yet, the two AC power outlets rotate 360 degrees in either direction to make room for two large, bulky plugs, like that of a cell phone charger. Just plug in one device and turn the outlet to make room for a second! The surge protector’s “turn and hold” system keeps rotated plugs in place. The protector features 918 Joules of advanced surge protection and two different LEDs to indicate that surge protection is fully active. If you’re still shopping for people on your list, and you hate going to the mall – I know your computer savvy because heck, you’re reading my blog, go to the link at the top of the page and click on it. You’ll be taken to the Home Controls site and you can start buying nifty, cool gadgets for the people on your list (and yourself, too). During the first night of the Blind Auditions I tweeted Adam Levine and blatantly told him that he had the Season 3 winner on his Team – Bryan Keith and I’m still going with that prediction. The very same thing happened to me during Season 1 (except the part about me tweeting Adam Levine) when I heard Javier Colon in the Blind Auditions. I knew he would win it all. Season 2 on the other hand, I was all over the board. I did not expect Jermaine Paul to win; I didn’t think he was that great of a soloist; I didn’t buy ANY of his i-tunes songs and I was rooting for Juliet Simms. Juliet Simms just didn’t know how prophetic the song It’s a Man’s, Man’s, Man’s World would be for her in Season 2, because in my opinion, it will be several years (if The Voice survives several years) before a female wins the whole pie. Which is sad. Because from where I sat, the public was dying to hear more from Juliet Simms and less of Jermaine Paul. Even today, with the field at 12, I’ll make my prediction down to the Final Four and I’m only going to pick one female and that’s because I feel Dez Duron fell on this face last night when he took a trip on the good ship lollipop with his song choice. Team Xtina: Sylvia Yacoub is probably the only female in this competition that can win it all, if the powers that be allow it. Her song choices are right on, she has talent oozing out of her, and every time you see her she’s sporting a different look. She doesn’t have any emotional baggage (or doesn’t talk about it if she does), she’s always up beat and smiling and she listens to her Coach. Didn’t you wonder why some of the better singers were eliminated by the Coaches last year? Like Jesse Campbell, James Massone? Team Blake: Terry McDermott has a pure, wonderful, rocker voice. No matter what he sings, he sounds great. He makes great song choices which has helped him prove to the judges that he can sing anything and sound great at it. He doesn’t have any emotional baggage, he’s always upbeat and again, he listens to his Coach ( I think Blake probably has more emotional baggage than Terry does). Terry is from Ireland, was previously in a band, has a wife and child, he’s moving on in a new direction and a solo career is part of that and even if he doesn’t win The Voice, I bet record executives have already been slipping their business cards under his door or into the hands of his wife. Team CeeLo: CeeLo has 3 great singers on his team. I like the underdog, Cody Belew. I loved him the minute I saw him but he’s got to start thinking like a competitor and realize that CeeLo is also giving good advice to Trevin Hunte and Nicholas David – because CeeLo sees 2012 as “His Year To Win.” Blake won Season 2, Adam won Season 1 and he’s just going to side step Christina. Cody needs to watch out for Cody. He needs to start making better song choices – masculine song choices. There’s nothing wrong with Tina Turner – but he should start listening to that little voice inside him and I don’t mean the voice from that elderly black lady he seems to be channeling lately. Bryan Keith is my pick to win Season 3 of The Voice. (ASSOCIATED PRESS) The night started off with 12 contestants – three on each team – but now that we are in the live shows, two artists will be sent home each week, based on audience votes. Carson Daly teased Christina Aguilera about the difficulty of leaving the decision in the audience’s hands, and she admitted to being a bundle of nerves. New this season is the twist that the final four contestants standing are not guaranteed to represent each of the four teams, as each artist is competing on his/her own for votes. The Voice hosted by Christina Aguilera and Adam Levine airs Mondays on NBC at 8:00 pm ET. Blake’s anime-cartoon-come-to-life, Michaela (Page), was up first with her cover of Pink’s latest hit. She fought a bit against the low pitch of the song and the extreme length of her fake eyelashes, but the judges enjoyed it as a solid performance. Blake begged the audience to please vote for his star. She did not sport her trademark mohawk tonight, and her luck may be gone with her locks. As sentiments for a singing competition go, this title is probably more optimistic than the last one. Team Christina Aguilera’s sole male member, Dez (Duron), grooved his way through the Lauryn Hill version of this song. I imagine this is what the entertainment looks like on a Disney cruise ship. Christina made her pitch for Dez, touting his “heart of gold” as a reason to vote for him. Based on the screams of the girls in the audience, he should survive tomorrow night’s eliminations. Adriana (Louise) was the next member of Team Christina Aguilera to take the stage, in front of an unfortunate and distracting shooting star graphic. She was the first one to bring a hungry-for-the-win attitude to the stage, and she ended her version of Carrie Underwood’s song by leaning playfully over Adam Levine, which he evidently enjoyed. It was a confident, fun performance overall. Another statement I can get behind is Cody (Belew) belting out Tina Turner’s “The Best.” A country boy wearing a sparkly suit and singing an 80s power ballad? That’s pretty much the way to my heart, yup. Blake Shelton stated that Cody is “meant to be on stage,” and Christina requested “more bopping around” from future performances. Cee-Lo Green was proud of the fun, natural performance from the contestant he saved last week. Team Adam Levine’s, Amanda Brown, was up next. She emerged like a golden goddess in a long gown and hot pants. As much as I like her voice, I can’t say I was a fan of this performance, which was uncharacteristically screechy and uncomfortable. Christina rambled on for a little and I had time to ponder her ensemble — I’m guessing that either she lost a bet or her stylist just hates her. Even Amanda’s coach, Adam, admitted this wasn’t her best performance; she will need votes based on her history on the show to save her. The Voice doesn’t really pretend to be cool, per se, but Bryan Keith’s version of Amy Winehouse’s “Back to Black” was perfectly slinky and suave. The judges all agreed that this was Bryan’s breakout moment of the competition, and Adam was proud of his prot’eg’ee. He should cruise safely into the top 10. Cassadee Pope from Team Blake Shelton discussed her estrangement from her father with her coach, relating how she had hoped to hear from her father during the course of the show. Note to Cassadee: the show that seems to reunite children most with their parents is RuPaul’s Drag Race, just saying. Christina related to Cassadee’s pain and all the judges cheered her very sincere delivery of this Kelly Clarkson song. Okay, one of my favorite contestants (Trevin Hunte) on this show was taking on one of my favorite songs of all time, so I was just hoping against hope that he would stay out of Michael Bolton territory. He didn’t go Bolton, but he did steer the ship straight into church, and it was a bit too gospel for my taste. He certainly has a beautiful voice, though, and as the most likeable contestant, he should easily proceed to the next round. Cee-Lo Green’s hip-hip-hippie Nicholas David took on the Huey Lewis classic “The Power of Love.” The song seemed to get away from him a bit, and the coaches even found a way to spin that in a positive light. This was one of my least favorite performances of the night, even though he is such a sweet guy. Team Christina Aguilera’s Sylvia Yacoub boldly chose Celine Dion’s Titanic anthem, “My Heart Will Go On.” I think anyone covering this song would sound like a high school talent show contestant, and the judges all praised Sylvia’s ambition while noting her nerves. Verdict: meh, not likely to bring in the votes. Terry McDermott closed out the night with “More Than a Feeling.” This guy might like the 70s more than Lenny Kravitz does, and his voice is perfectly suited to the era. If there are enough nostalgists in the voting public, he should move on again. Will Netflix, YouTube, Hulu Content Create a ‘Second Revolution’ in Television? | The Wrap Media. This is an extremely interesting and important article you should take the time to read. It explains the importance Hulu, Netflix and other up and coming streaming services will play in your television watching future. I personally still use Hulu to get caught up on some television shows but I never could see the advantages of Hulu Plus. Then I discovered Roku. 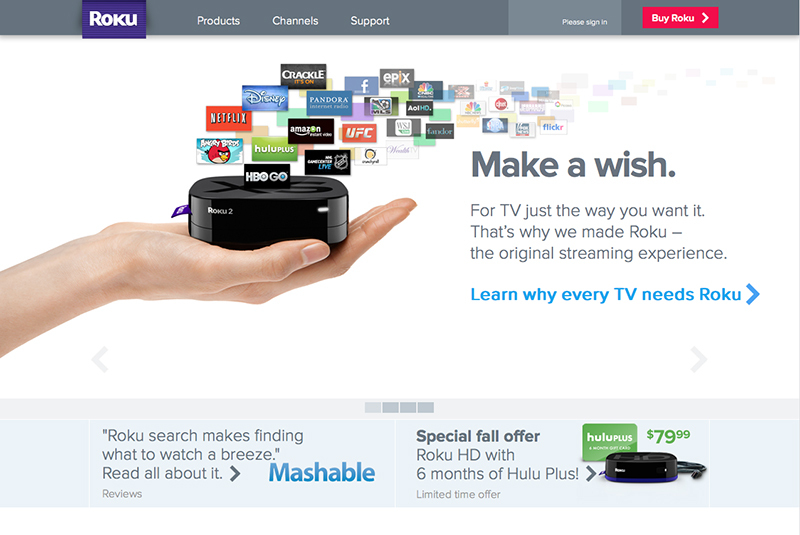 I personally don’t use a Roku, but people who do say it’s the only way to stream and watch television (see the screen capture at the end of the page). I use to have both streaming and mail delivery Netflix but that was because I would “listen” to Netflix at work. Now I just have mail delivery Netflix. The nice thing about Netflix, even now, as mentioned in the article above … “At the start of every season, Netflix releases all of a show’s episodes simultaneously. The move is a nod to the binge habits of its members, Netflix says, who prefer to see an entire season in a few sittings as opposed to tuning in for the latest episode at a particular time every week …” which was me and in some cases, still is me in a nutshell. At this very moment I’m banking my A&E Hoarders episodes on my bedroom DVR because I HAVE TO WATCH them during my Thanksgiving vacation from work. I’m also saving up my FX’s AHS: Asylum episodes on my HD DVR for my vacation Christmas/New Year’s and I banked a bunch of shows during August, September and October so I could zap through the … yep, you guessed it … the constant political commercials (I am so glad that’s over). Now scroll to the top of the page and hit the link and read the article. It’s a little long, but it will get you so educated on what’s coming down the road and will give you talking points at your next dinner party. For just $49.99 it will deliver streaming TV. Now that Copper has concluded its first season, the waiting game begins. BBC America has plenty of other shows you might want to check out. 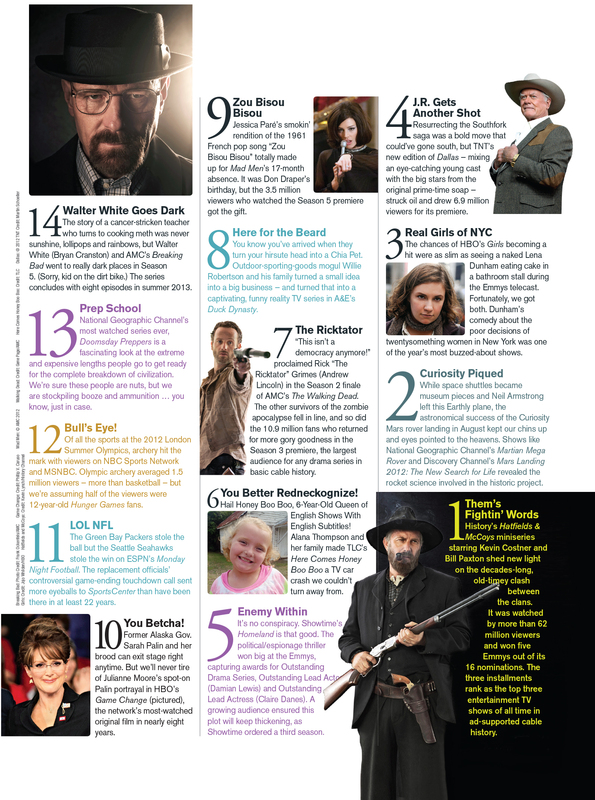 Several people swear by Dr. Who, though that’s not my genre, plus there’s just so much I can DVR, watch, and blog about. 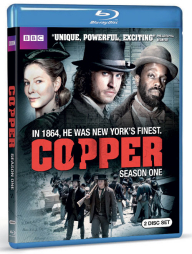 I received a tweet from @Copper today that the first season of Copper was out on Blu-ray at a really good price. You might want to purchase it and then you’ll have something to show your friends when they’re over for dinner and there’s just absolutely nothing worth watching on TV. You can pull it out and save the evening. Just in case you might ask, Tom Weston-Jones is not available to deliver it personally (I already asked). Welcome to turbulent New York City during the Civil War, where rough, restless Irish-American cop Kevin Corcoran (Tom Weston-Jones, MI-5) patrols the teeming streets of lower Manhattan. Join Kevin on risky forays to the elegant, emerging black neighborhood on upper Fifth Avenue to seek help of his war buddy with his detective work. Will Kevin ever learn the truth about the disappearance of his wife and the death of his daughter? Seen on BBC America. In case you don’t have a Blu-ray, you should seriously think about getting one, especially on Black Friday. Check online at some of the top electronic sellers. They tend of have a lot of sales that are available “online” only. That’s how I got my rather expensive Blu-ray player for a super good price.